Manage your fridge. Find out what to make on a whim. We wanted to create something that would be useful and also use various technologies we were interested in. intelliFu allows people to scan their grocery receipts, and uses clever algorithms to maintain an accurate database of items in your fridge and pantry. 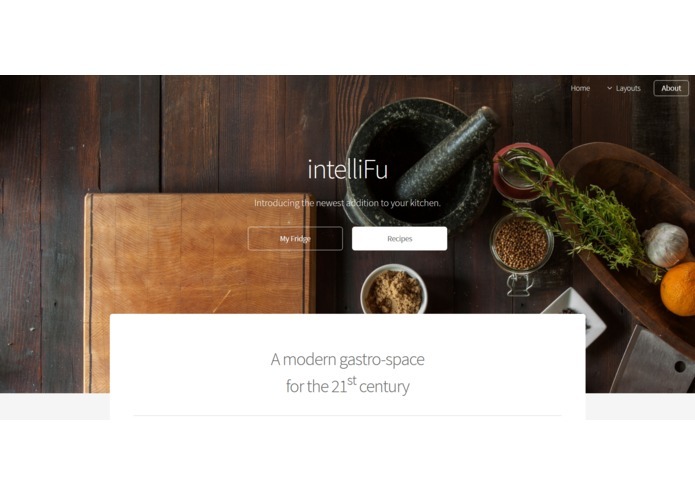 Then, intelliFu suggests recipes based on available ingredients. We used optical character recognition (OCR) methods in Python (tesseract) to scan the receipts, and the dropbox API to store the images for easy access from a web server. When the user accesses the intelliFu web-app, the most recent dropbox scans are processed by OCR and added to a SQLite database. Finally, we use Spoonacular's Food API to suggest recipes based on matches to the pantry database. Merging multiple python libraries, powering through the many SQLite and php errors, and running a 5k. We experimented with methods for optical character recognition, gained proficiency in jQuery and SQLite, and learned about APIs that are made just for sending requests to use OTHER APIs! First, a simple mobile app to quickly scan receipts and see recipe ideas (currently, the user takes a photo and uploads it to a pre-named folder in dropbox). We also want to migrate all of the code and databases to a web server, and incorporate a secure login screen for people to access their own pantries. I worked on the code that detects when a user uploaded an image, processes it with OCR, and stores the results.